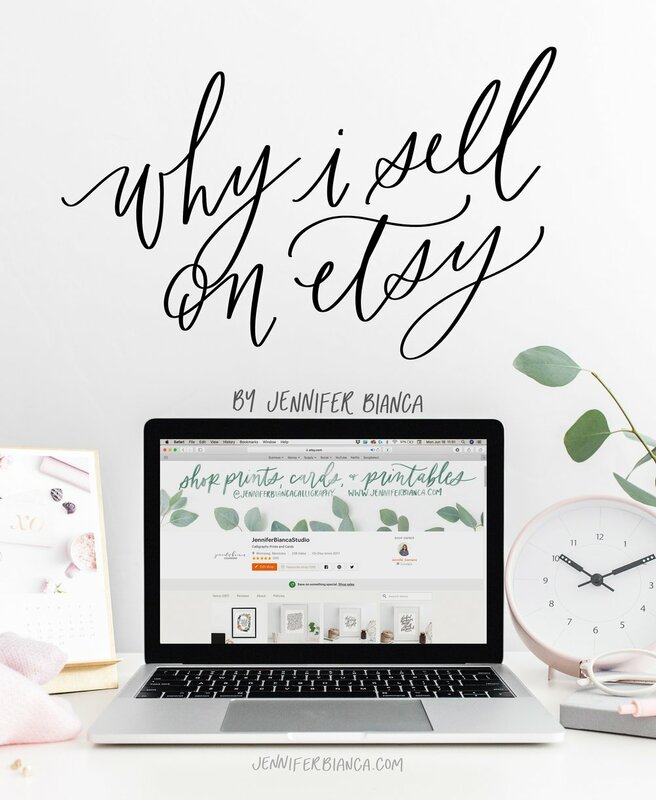 Today, I want to explore the topic of selling on Etsy, and why I've chosen that platform, because picking a platform can be hard when you're starting out! There are a lot of pros and cons to any selling platform, and after some experimentation and a lot of dislike for the platform, I've landed on Etsy as my top choice. So what changed my mind? First, let's talk about my journey with selling and how I got here, and then we'll dig into the pros and cons of the platform. When I started my business, I first sold on Etsy. I chose it because I didn't have my own website and Etsy was the only selling platform I knew or had experience with. Etsy is very beginner friendly with next to no start up cost (you need $0.20 to list your first item) and no need to have a brand or business plan. Seemed like the logical choice but I soon switched over to selling on my own website. Oversaturation of the market. Like, hey, there's a lot of competition in the handlettering and calligraphy category. I didn't want to make it easy for my customers to choose my competition over me, or to be distracted by recommended listings and click out of my shop without purchasing. It didn't feel really professional, and to maintain an image of professionalism I thought I needed my own website to sell through. "Professionals" I was listening to advised NOT selling on Etsy. And I listened to them. I wasn't making tons of sales. Looking back, this wasn't Etsy's problem but rather my terrible print designs, and the fact that I had only 5 different listings. In late 2015 I set up my website to include my online shop for the reasons I listed above. My sales sucked during this time. I was growing a decent Instagram following and working it at in-person markets but my online sales didn't match. I got fed up and needed to make a change... again. After a lot of dissatisfaction with selling on my own, I decided to jump back on Etsy and manage both my Etsy shop and my own website. I made this switch secretly and didn't notify any of my social channels that I also had my Etsy up and continued to direct everyone currently in my community to my website's shop. This way, I could see how much traffic I was generating, and how much Etsy was generating on it's own. And here's what happened: my Etsy shop outsold my own website by 300%. I decided that my Etsy shop was definitely staying up. But then I had a problem... should I keep up my website's shop? I decided against it because it's simply too much work trying to maintain and update two shops. Down to one shop I went. Nov 2017 - Present: Etsy only! For the last 8 or so months, I've been selling exclusively on Etsy. And what are the stats? Why do I think this is? Etsy generates traffic I can't generate myself. In 2018, they've sent me 45% of my shop visits - that's 2000 visitors who have seen my shop that wouldn't have otherwise. And that doesn't include visits that were to a listing alone (and not my full shop). Etsy traffic accounted for 50-75% of my listing views (that's 7000 to 10,000 listing views generated by Etsy alone). Better product photography. I started using a stock photography service for my print photos. GOOD PHOTOS RULE THE ONLINE WORLD. My social media (ahem, Instagram) following has grown significantly and I'm generating more of my own sales because of that. More listings. 5 listings do nothing on Etsy. I currently have 200+ listings on Etsy which means I have a lot better chance of getting found. Okay, let's get into the pros and cons of selling on Etsy. They already have a huge and dedicated audience that loves to buy from handmade businesses and small shops. Take advantage of an audience that ALREADY wants to buy from you! Built in SEO that generates traffic that is hard to generate yourself (unless your social presence is HUGE, and even then high followings don't equal high sales). Easy order management and shipping systems. A built in review system to build trust with buyers, along with the ability for your shoppers to see how many others love your shop and how many sales you've made. Easy statistic and finance tracking. They're in the process of making some major updates that I think will be SUPER helpful and may tear down a few of the "cons" listed below. Competition and undercutting. All markets on etsy are saturated and every market has people who aren't taking themselves seriously and are pricing way too low. I laugh at some of the prices I see, and I've continued to price in a way that feels right to me and like an industry standard among my peers rather than pricing based on what I see on Etsy itself. And it's working just fine. Shoppers take shops seriously when they take themselves seriously by pricing correctly. Lack of brand recognition. People often say they "bought something off Etsy" rather than identifying the specific shop they got it from. This can make word of mouth sales challenging. Limited shop customization. Your shop will look like everyone else's shop - besides your shop banner and your product photos. No email list integration. As someone who is building her email list, it's frustrating to not be able to capture emails upon purchase. Apparently this may be changing in future Etsy updates. The PROS heavily outweigh the CONS for me these days, but that doesn't mean I want to be on Etsy forever. I'd love to build my own Shopify shop at some point, but not yet. I don't have the time to update and balance two shops at the moment, so I'd like to make the switch when I'm generating the bulk of my traffic (and not relying on Etsy to do it for me). Shopify seems to have the same SEO abilities as selling off my Squarespace site, and so many people report needing to invest in actual advertising to gain traction there. I'd like to skip that if possible. Etsy has been AMAZING in my experience, but that doesn't mean it will be for anyone else. When I've compared it to selling on my own and relying on my own traffic, it shines in comparison. There are always pros and cons, but the pros outweigh everything for me at this point. That doesn't mean Etsy is my be-all-end-all, but I'm sticking around there for now (even with shop fees going up in the coming weeks).